Recently there has been much concern over rising inflation in Singapore. Looking at the Consumer Price Index (CPI) the average figure for the year 2009-2010 was 2.8% (shown in blue). 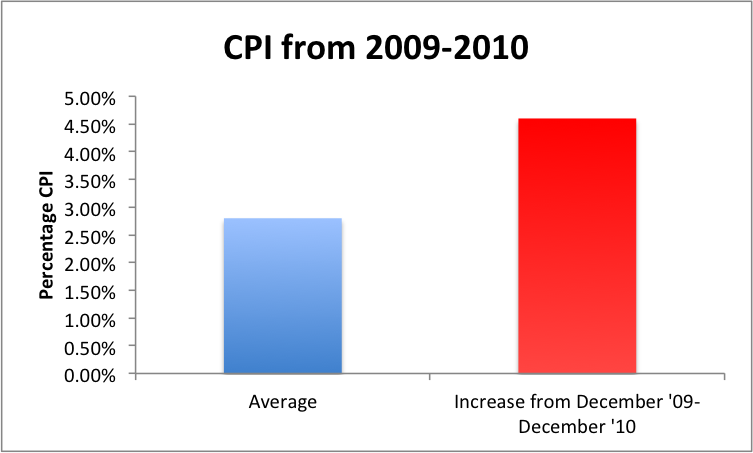 More alarming the CPI figure in December 2010 was up by 4.6% (shown in red) from December 2009. So inflation is clearly rising and furthermore the rate is accelerating. 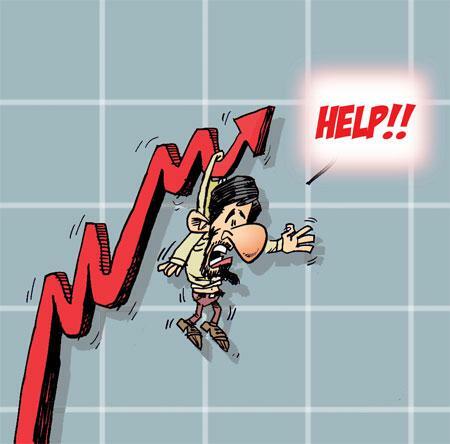 How much should you be concerned and is inflation the biggest problem we are facing in our economy? Housing, transport and food were the main contributors to the rise in CPI. As they form a larger proportion of household expenditure for those on median incomes and below, the true rate of inflation for these income groups is much higher. As always the effects will be magnified even more for the bottom 20% of the income distribution. What really matters therefore is where you are on the income distribution. The government line would be that this was beyond their control. They will say that inflation has been rampant everywhere in Asia and particularly in China and India (at least 5% and 10%p.a. respectively). No doubt the incumbents will blame poor harvests and extreme weather for the surge in food costs coupled with the leap in oil prices back above US$100 that has occurred as the world economy recovers. However as usual this is to only tell half the story. That is why we must re-examine the contents of our rice bowl. Is it the surging economies of China, India and the rest of Asia cracking the porcelain of your bowl? Or is it domestic inflation caused by policy decisions of our own government? It is relatively simple to measure the contribution of external factors to inflation by looking at the index of import prices. Last year the Singapore dollar rose by 9% against the US$ (shown in red). This meant imports priced in US$ became cheaper when converted to S$. As a result the import price index in 2010 was up only 0.7% compared with 2009 (shown in blue). You need no further demonstration that it is in fact domestic factors which have played the major role in inflation. Further supporting this, in 2009, the import price index fell by 8% yet the CPI was still positive. Therefore most of our inflation is being generated domestically. In Singapore this government’s policies have allowed companies to bring in a virtually limitless supply of cheap labour from the rest of Asia thus ensuring that there is continuous downward pressure on real wages. This, together with low corporate taxes and generous subsidies for new foreign investment has been a recipe for rapid growth. However productivity growth over the last fifteen years has not kept pace. In fact it can only be described as abysmal. In 1994 Paul Krugman, the Nobel Prize laureate, pointed out that there was little qualitative difference between the Singapore model and the Stalinist one of the 1930s Soviet Union and predicted that as Singapore ran out of labour inputs ( declining birth trend) its growth rate would fall sharply. Our government mistakenly thought that had found an escape route from this trap. By opening the floodgates to foreign labour while having no floor on wages, it seems they thought the economy could grow indefinitely. At the same time Singapore’s population could expand without limit. In fact MM Lee recently came out to warn us all that if we wanted slower population growth through immigration we would have to accept lower GDP growth rates. Clearly the only solution the incumbents have for producing GDP growth is by increasing the importation of labour through immigration. The result has been a big fall in the proportion of GDP going to wages and relentless upward pressure on the factor of production in (virtually) inelastic supply, namely land. This has suited the government just fine as it owns nearly 80% of the land and thus benefits from the rise in land prices. Of course rising food prices globally play a big part in the rise in food costs locally. But the competition for land is undoubtedly playing a significant role in the rising cost of meals at food courts, hawker centres, supermarkets and wet markets as rents rise. I hear these complaints from stall holders continuously as I go about my walkabouts several times a week. Another domestic factor contributing to rising inflation is government and GLC policies that favour the creation of oligopolies such as integrated food court operators. Make no mistake! GLCs are not in the private sector, they have virtual monopolies and no real competition to their power to pass on costs by putting up prices. The government’s ownership of most of the transport system, from the MRT to taxis, and the lack of an effective regulator, also means that the transport companies have been able to more than pass on the rise in energy costs stemming from higher oil prices. The result is further pressure on your wallet. Here’s one for the students of economic history. Back in 1926 before he published his general theory, Keynes warned against a type of inflation that transfers income from workers to profits. Are we seeing that inflation here and now? The economy is overheating but the benefits are going to profits and not to working Singaporeans. Certainly we can see this effect in the CPI index. The HDB resale price index has risen some 340% in the last twenty years while median nominal household income has risen by only just over 100%. Even though The Department of Statistics uses an archaic method of calculating housing costs the effects are still apparent. With such an elastic supply of foreign labour it is no surprise that average nominal incomes have lagged behind inflation over the last three years and median real household incomes have essentially remained unchanged for nearly thirteen years. And despite years of strong economic growth consumption has fallen to just over 40% of GDP. The incumbents will try to divert you with a bit of hype about fertility rates. (The downward trend in birth rates is for another article.) But this is merely an attempt to shift the blame on to you for not having enough babies so that our minsters to continue to support the current immigration policy. Don’t let them scare you with those simple GDP figures either. I had already dispensed with that bogey in my previous articles. What we need from our GDP is quality not quantity. We need policies that achieve economic growth by raising the productivity of our inputs (workers) and not by just increasing the inputs themselves (importing foreign workers). The lack of a raise in real median incomes, our appalling productivity figures and the strain on scarce resources like land should be more of a worry to you than inflation. Only by shifting focus and reducing the strain are we likely to get a slow-down in inflation accompanied by rising real wages. Your rice bowl will be all the happier for it.